Melissa has a green blanket that is soft with satin edges. She doesn’t remember a time when she didn’t have this green blanket, and that blanket is special because she can hide underneath it and become invisible. But one day, green blanket is missing, and poor Melissa looks all over for it. With the help of Mom, Melissa is reunited with her green blanket and rejoices. 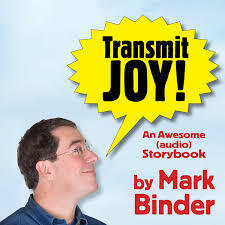 Before I get into my review, I want to share why I requested this audio book and how it personally touched me. Our youngest daughter, Sarah, is six. She, too, has a green blanket with satin edges that was given to me before she was born. She also likes to hide underneath her green blanket–though it doesn’t cover up as much of her body as it used to–and disappear. Green blanket got tucked into her bag today to make the short trek to school, so that Sarah can have him (yes, it’s a boy) for rest time. And every night, “Greenie” goes up to bed with Sarah; she folds the special corner of her blanket into a certain way–I still haven’t learned how to fold it right–and she snuggles with him. I couldn’t help but think of Sarah as I read this book, and I can’t wait to share it with her. 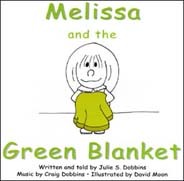 Okay, weepy mommy moments aside, Melissa and the Green Blanket is an adorable audio book written and told by Julie S. Dobbins. It is a contemporary retelling of the Biblical story of the woman with ten silver coins who has lost one and searches high and low for it until she finds it, which comes from Luke 15:8-10. Though the Bibilical significance might be lost on some children, there is no escaping that this is a truly wonderful story, especially for bedtime. The music, provided by Julie’s husband Craig, is soft and calming. There are two additional tracks of Craig’s music included on the CD that will help lull your child to sleep after you’re done reading. Also included is a 24-page picture book that is illustrated by David Moon. 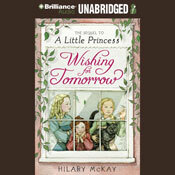 Again, my mind wandered back to Sarah as I followed along with the book and the audio. Just like Sarah, Melissa has a cat that is seen in many of the illustrations. Just the other day Sarah wrapped the cat up in “Greenie”. Your young child will adore Melissa and the Green Blanket. So will you! Available at http://www.craigdobbins.com/Melissa.html, Amazon, CDBaby, iTunes, and CCNow.